Courtesy of “The Making, Shaping, and Treating of Steel”. After it is refined, the molten steel is tapped into refractory lined ladles. The steel is then teemed (poured) into a series of ingot molds. After the ingots solidify, the ingot molds are stripped and the ingots are placed in soaking pits for heating and to equalize the internal and external temperature. 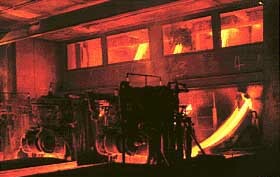 Following the soak, the ingots are hot rolled in large primary rolling mills to produce slabs, blooms, or billets depending on the final products desired. Ingot – Ingots range in size from several hundred pounds for specialty steels to 300 tons for large forging applications. Slab ingots range in weight from 10 to 40 tons – averaging about 20 tons. Ingot shape and weight are selected to meet the specific requirements of the product to be made. Soaking Pits – The soaking pits are equipped with burners to provide heat when necessary. Cutting into desired lengths or removing heat specimens or defects. Conditioning the steel products by removing surface imperfections, straightening, sizing, etc.